Tree Speak | Casey Trees: Is My Tree Damaged? As we are in the midst of another stormy winter, we wanted to share some information on trees and storms. This first of a two part series will help you answer the question: is my tree damaged? A subsequent post will help you answer the question: if so, what can I do about it? In The Body Language of Trees, a handbook for failure analysis, Claus Mattheck and Helge Breloer set out a process for performing Visual Tree Assessment (VTA). The 3-step VTA method should be used to confirm the presence of a defect. If a defect is found, it should be further investigated. Mattheck and Breloer propose that we can inspect a tree for defects by reading its body language. Trees grow in ways that make sense. The roots provide stability and water and nutrient uptake. The crown (leaves) provides leaf surface, and so represents food-generating potential through photosynthesis. The stem connects the top and the bottom, providing connectivity and support. Trees grow according to the Axiom of Constant Stress, which states that an optimal structure has a uniform stress over the whole of its surface. So trees invest material to reduce mechanical stress. If you see something that does not look normal it is a cue to further investigation. Walk 360 degrees around the tree of at all possible. Look at the roots, then the trunk, then the crown. Be careful! There may be damaged or hanging limbs in the crown – they could cause injury if they fall. Some common types of failure associated with storms are uprooting, stem failure, and limb failure. If the tree is leaning and there is a soil mound or exposed roots on one side of the tree, it could indicate that the root system is failing. Indicators of potential stem failure include cracks, bulges, cavities, and bent stems that do not return to vertical after snow or ice loading. Limb failure indicators are similar to those for stems. So walk all the way around your tree and inspect it from roots to crown. If you see something that doesn’t look “normal” (a crack, break, lean, etc.) it is a flag that something may be wrong. 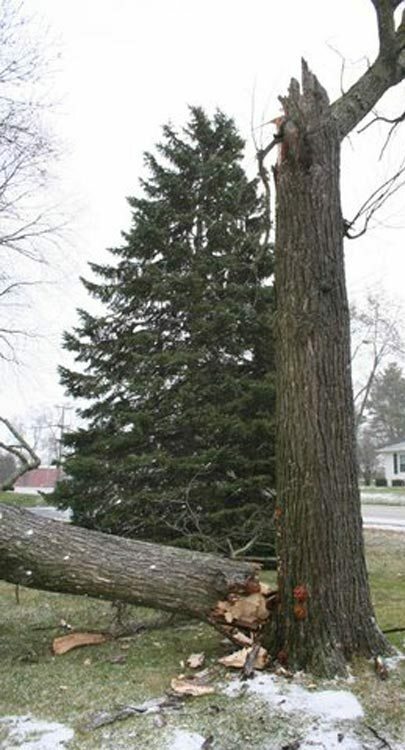 In such cases, we recommend that you hire a Certified Arborist to inspect and treat your tree to minimize risk. On Thursday, we will discuss which types of damage can be fixed and which types cannot. Can My Tree Be Fixed?